These are awesome winter gloves - both for doing barn chores and for riding. They are warm with 3M Thinsulate and Polar Fleece lining and "Wintersun" thermal feelings fiber. What this means is that your hands stay warm and nimble in sub-Zero temps. What we really liked is the extended wrist on the glove which spans the gap (between your glove and coat) - an area that is often exposed while wearing other gloves. This area stays covered even when you are reaching for things and while riding. With a 4-way laminated lycra shell the gloves are also flexible enough to wear while: fastening halters and lead ropes, opening and closing gate latches, and mixing supplements into grain rations. 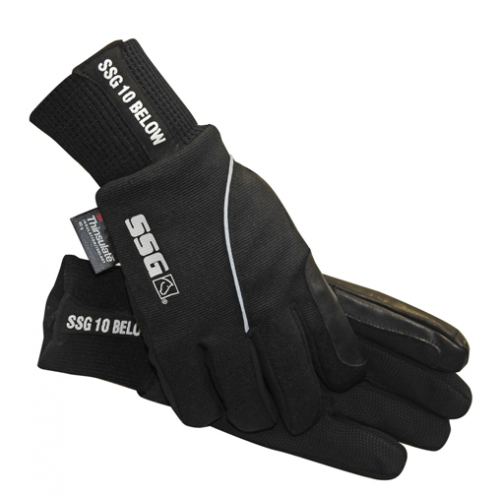 These gloves are also designed with reinforced rein grips to help with winter riding. At the same time they are "touch screen friendly" and are designed with the SSG Digital Palm - allowing you to still use your elctronic technology . The waterproof membrane feature is especially nice when handling water buckets and cleaning out snow in barn door tracks . . . and helps to keep your hands dry even when the gloves get wet.